Alopecia areata is a common (1-2% of the population) form of hair loss. There may be small patches of hair loss or the whole scalp may be affected. Resolution occurs in a few months or the condition may persist for years. There may be slight inflammation of the skin in the affected areas—in keeping with the possibility of an underlying immune reaction against the hair follicles. There is also an association with autoimmue disease and atopy. In the affected areas the follicles are visible and empty. The hairs about to be lost have an exclamation mark appearance and in some areas that are resolving, fine vellus hairs are seen. Alopecia areata is characterized by rapid and complete loss of hair in one or more round or oval patches. Alopecia areata is typically 1-5cm in diameter, usually on the scalp, bearded area, eyebrow, eyelashes, and less frequently, on other hairy areas of the body. Alopecia areata often starts quite suddenly as one or more rounded patches from which the hair is lost. The hair loss continues for days or weeks, until all the hair from the affected sites has fallen. 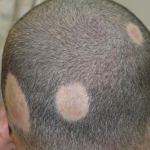 Affected areas may extend outwards and disease activity can be recognized by the appearance of so-called exclamation mark hairs at the margin of the lesions. The condition occurs over a wide age range, but seems particularly common between the ages of 15 and 30 years. Regrowth of alopecia areata patches occur in most patients if the affected areas are small, limited in number, and the affected individual is 15 years old or less. When regrowth occurs, the new hair is fine and non-pigmented. The outlook for regrowth worsens when large areas are affected. Around 50% of patients show fine pitting or wrinkling of the nails. An immunological (Associated with autoimmune disease) basis is suspected because of an association with thyroid disease, vitiligo and atopy. Histologically, T lymphocytes cluster like a swarm of bees around affected hair bulbs, having been attracted and made to divide by cytokines from the dermal papilla. Alopecia areata is probably inherited as a complex genetic trait (Familial in about 20% of cases and Associated with Down’s syndrome), with an increased occurrence in the first-degree relatives of affected subjects and twin concordance. The existence of trigger factors, such as stress, fits with this idea. 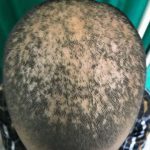 An initial limited area of alopecia areata in adult life can be expected to regrow and treatment is generally not needed. A patient with a first or minor attack can be reassured about the prospects for regrowth. Tranquillizers may be helpful at the start. The use of systemic steroids should be avoided in most cases, but the intradermal injection of 0.2 mL of intralesional triamcinolone acetonide (10 mg/mL), raising a small bleb within an affected patch, leads to localized tufts of regrowth while not affecting the overall outcome. This may be useful to re-establish eyebrows or to stimulate hope. Spirit-based steroid lotions and mild irritants, such as 0.1–0.25% dithranol, are often used but with limited success. Ultraviolet radiation or even psoralen appear in the centre of patches as fine pale down, and gradually regain their normal thickness and colour, although the new hair may remain white in older patients. Subsequent episodes tend to be more extensive and regrowth is slower. Hair loss in some areas may coexist with regrowth in others. Regrowth is tiresomely erratic but the following suggest a poor prognosis. 2 History of autoimmune diseases (Down’s syndrome) or atopy. 3 Unusually widespread alopecia.Like: Nail involvement. Extensive hair loss or ophiasic pattern of loss. Recurrent episodes of hair loss or long standing loss. With ultraviolet A (PUVA) therapy may help extensive cases, but hair fall often returns when treatment stops. Contact sensitizers (e.g. diphencyprone) seemed promising but the long-term effect of persistent antigen stimulation is worrying; they are still being used only in a few centres under trial conditions. The efficacy of topical immunosuppressive agents (e.g. tacrolimus) has yet to be proved in a randomized clinical trial. Wigs are necessary for extensive cases. Visit a doctor if distressed by hair loss and want to pursue treatment. Also talk to a doctor if anybody notices sudden or patchy hair loss or more than usual hair loss. Sudden hair loss can signal an underlying medical condition that requires treatment. Also visit your doctor before using medication.